"All these years, my greatest nightmare has been that someone would strike at me through my friends. Now it's come true." "Listen, Bizarro's dead, the others are behind bars. What's to worry about?" "I... I don't know. It isn't rational -- It's just... Well, if the nuisances from my past are coming back as killers... what happens when the killers come back?" Originally published in September 1986, this "imaginary" story (that does make me laugh) was commissioned by SUPERMAN editor Julius Schwartz to answer any lingering questions at the end of his run on the book before John Byrne relauched the character. 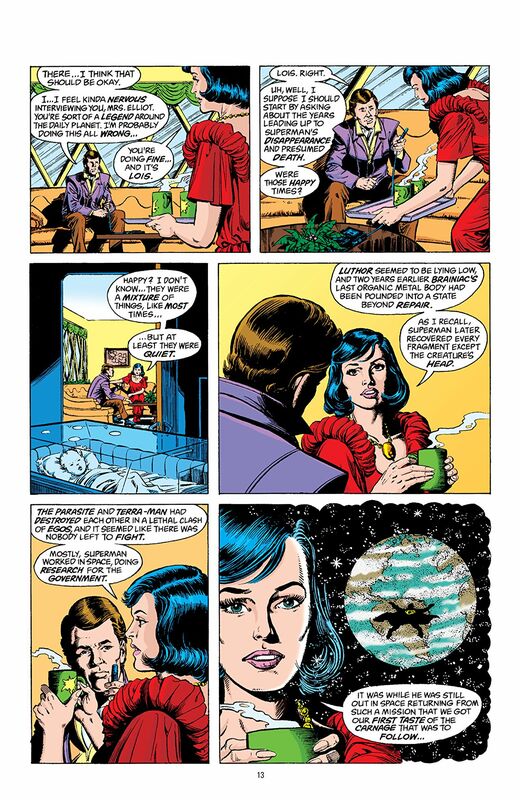 As such it takes place in the future, ten years after Superman's death, when Lois Lane is married with a son to Jordy Elliot and is interviewed by a Daily Planet journalist for their Memorial Edition. With clarity and with dignity, she speaks of the last days of the Man Of Steel when, after a lull, the crime suddenly starts escalating again with a murderous rage, threatening everyone associated with a Superman now publicly revealed to be reporter Clark Kent. 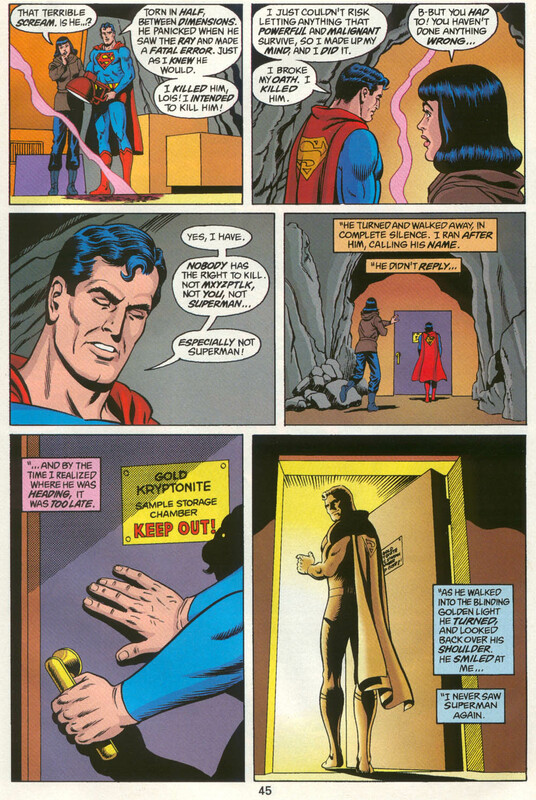 As a last resort he gathers up as many as will come to his Fortress Of Solitude: even Perry White and his wife, their marriage having descended into awkward bickering, and long-term rivals Lois Lane and Lana Lang. 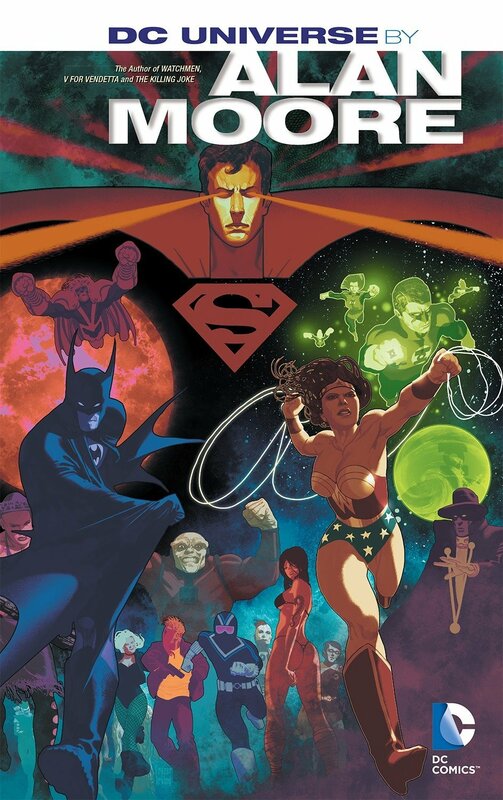 It's ominous enough that Krypto who's been roaming the stars for years senses the need to return, but when the Legion Of Superheroes arrive from the 30th Century in order to pay tribute, Superman begins to wonder... why now? "I think I'm going to die, and there's so much in my life I have to get straight... like me and Lois. Like me and Lana. You see, I've messed up both their lives, haven't I? They've wasted their love on me, while I couldn't let myself love either of them the way they deserved. I wish I'd explained. I wish I hadn't been such a coward." "You see," continues Clarke, "back when I was Superboy, Lana was the only girl I loved. She still represents Smallville to me, that part of my life, and because of that I could never cast her aside. ...But since I've grown and become a man, there's only ever been one woman for me. Lois. Beautiful Lois. I love her, Perry. Dear God, I love her so much... But I can't tell her without hurting Lana. I'd never hurt Lana, so I just walk around with this secret, this weight in my heart... and I'll carry it with me to my grave... and neither of them will ever know." 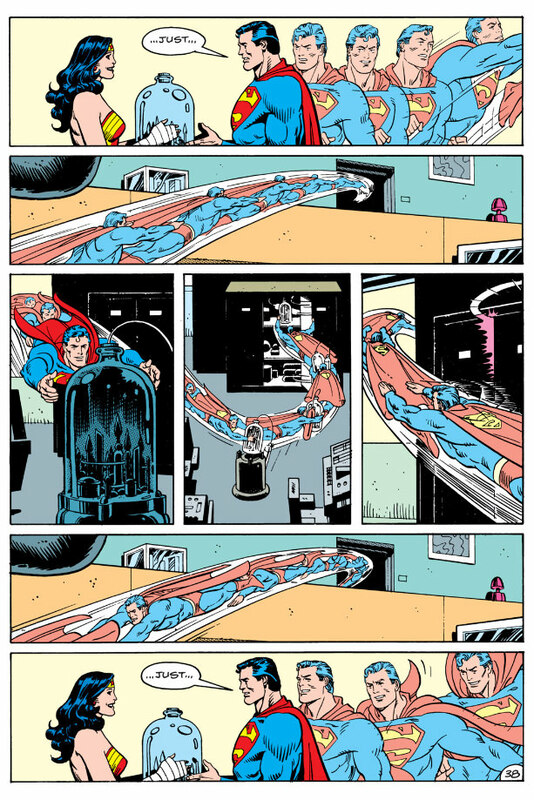 The exchange is made all the more poignant by Alan's careful timing as to what - or rather who - is represented in each panel and the subtle expressions Curt Swan lends them. 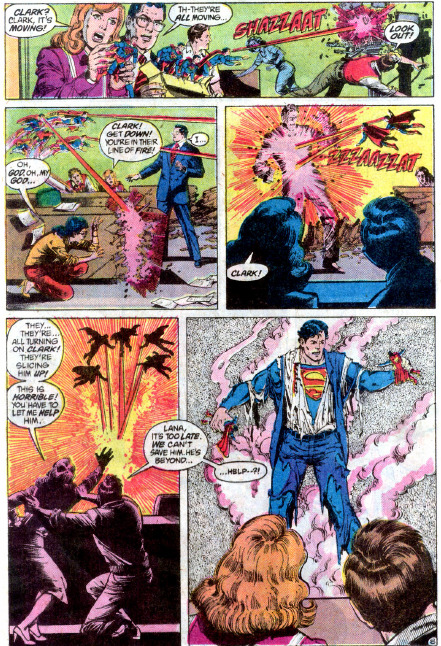 Swan had become pretty much synonymous with Superman by that point, whilst the inking is unmistakeably George Pérez. It has none of the explosive carnage of modern photo-realists, but then that's not why you should be here. You're here for the humanity yet make no mistake, Swan makes every self-sacrifice count as Krypto does what a dog will do in a final battle with The Kryponite Man, and the rest take on a Lex Luthor hijacked by Brianiac plus one other who's been responsible for all the recent pain and suffering. 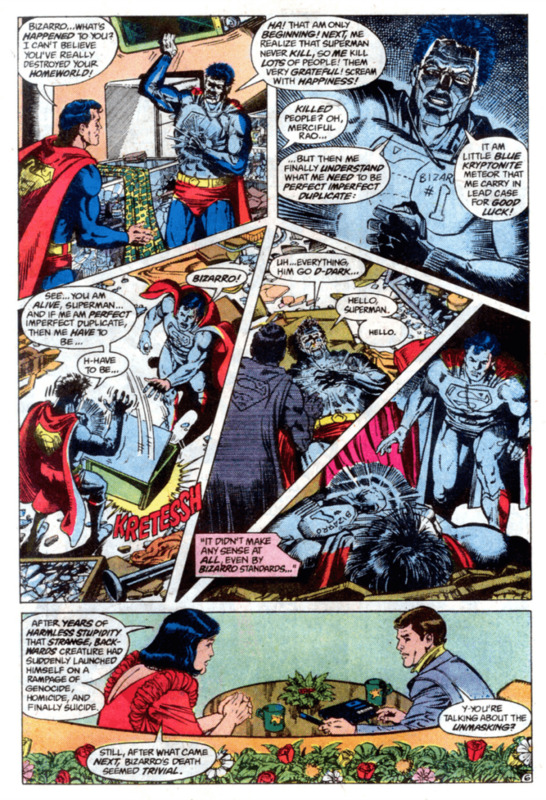 Also included are the two early Alan Moore Superman stories: 'The Jungle Line' from 1985's DC COMICS PRESENTS #85 co-starring The Swamp Thing, and 'For The Man Who Has Everything' from SUPERMAN ANNUAL #11 illustrated by Dave Gibbons. 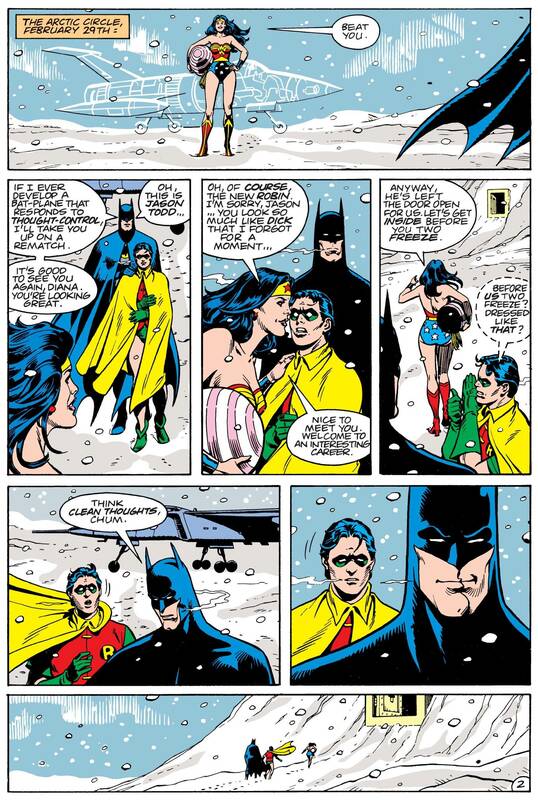 In the latter, Wonder Woman, Batman and his second Robin pay a visit to the Fortress bearing gifts for Superman's birthday. Unfortunately he's already opened one: an organism which has latched onto his body and invaded his mind. It's supposed to seduce Superman with a perfect existence, but interestingly enough although Kal-el is married with children on a Krypton still intact, there's trouble in paradise. His widowed father Jor-El was expelled from the Science Council for his faulty predictions and, in opposition to drug trafficking, and race riots which he's doing as much to inflame himself, has taken up with extremist sects like the Sword of Rao who march through the street like the Ku Klux Klan, their burning crosses being up-ended swords. A baker's dozen of stories from '85 to '87. Only a short period, but it feels like a 'best of...' of someone else's work. About half of this I've never seen before because when came out when Moore was still rising up through the ranks and, once you'd heard about them, they were pretty unobtainable. 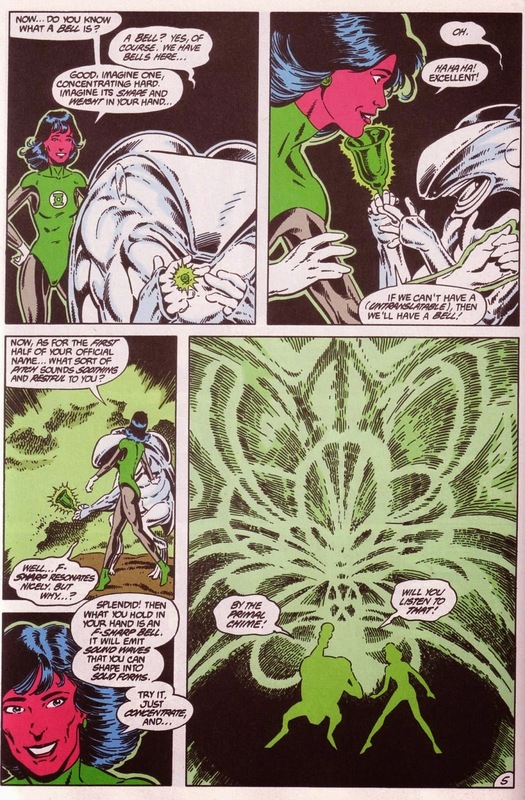 His GREEN LANTERN CORPS was always fun. Even now, if you give him the possibility of an alien race, he'll come up with an idea so obvious that you wonder why it took so long to be voiced. As with all of his writing, connections are shown. So, a new Green Lantern is needed in a far flung sector and a missionary is sent out. The problem starts when she realises that it's a light-free planet and all the inhabitants are blind. How do you explain what a lantern is? One of the other GLC stories has Kevin O'Neill art and got into trouble with the Comics Code Authority because of the foul, dripping artwork which makes you realise how lucky we were to have him on [2000 AD's] NEMESIS in the UK. As a nostalgic superhero fix, it's the tops. You get Batman, Superman, Swamp Thing and some very nice Dave Gibbons artwork. Includes: ACTION COMICS #583, BATMAN ANNUAL #11, DC COMICS PRESENTS #85, DETECTIVE COMICS #549-550, GREEN LANTERN #188, THE OMEGA MEN #26-27, SECRET ORIGINS #10, SUPERMAN #423, GREEN LANTERN CORPS ANNUAL #2 & 3, SUPERMAN ANNUAL #11, VIGILANTE #17-18, WILDCATS #, WILDSTORM SPOTLIGHT #1, VOODOO #1-4 and DEATHBLOW: BY BLOWS #1-3.